The Prayer Rock is a flat rock next to the Great Stone Face. It weighs 65 tons and has a feminine quality to it. After Jung Myung Seok petitioned the Lord for a rock, the Lord made it possible for the Wolmyeongdong Recreation Center to dig up this rock. It was all thanks to the Lord. It all happened in the October of 2002 when Pastor Jung was on a mission trip in Hong Kong. While he was praying, the Lord told him that he would find a treasure beneath a persimmon tree in the parking lot of Wolmyeongdong. At that time, however, Pastor Jung did not tell anyone about what the Lord had said. Under the persimmon tree, Pastor Jung’s church members discovered a pumpkin rock. It was yellow, like gold, and it stuck out of the ground like a turtle sticking its head out of its shell. After they found it, they started to work on excavating the rock. However, they did not know how big it was going to be. In the end, they unearthed a massive 65-ton rock which weighs as much as 65 sedans. Once they dug out this shiny, golden-colored pumpkin rock, they saw that it was an epic rock. It was so smooth that they wanted to hug it as if were a beautiful woman. Since Pastor Jung was overseas, the workers asked the Holy Son to supervisor the work onsite. Pastor Jung was in a situation where it was difficult to convey all of his instructions to the workers who were working. However, prayer and effort overcame time and distance and made the impossible possible. Ultimately, the church volunteers transferred the rock safely to Wolmyeongdong. We also call the Prayer Rock the Holy Spirit Rock sometimes because of its smooth body and ladylike quality. Pastor Jung was so awestruck that they had dug up such a big rock like this. He went from being in awe to being moved. The Lord allowed him to dig up this rock through the church members because of the prayer condition he set. Even though the Lord had told him that it would be a good rock, Pastor Jung did not know how big it was going to be. The rock surprised him because of its size and because it looked like the smooth body of a woman. The rock’s shape was also surprising. It was flat and had pretty good form. 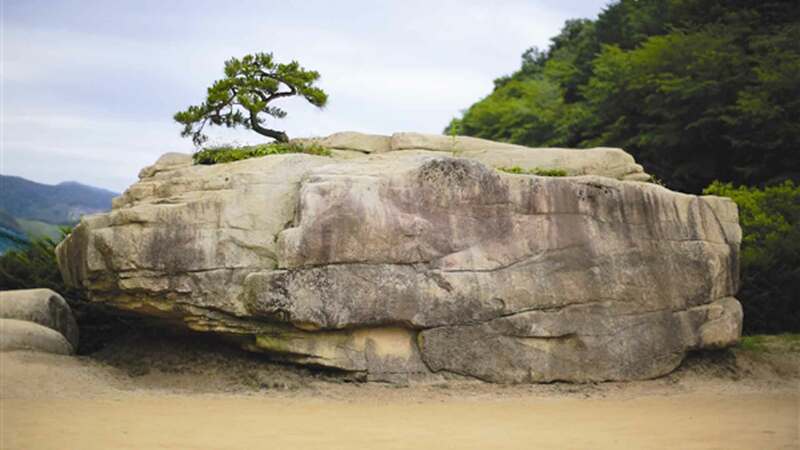 People can come to sit on its cozy seat and touch it with their hands because of the rock’s smooth surface. It is a comfortable rock art piece that about 10 people can enjoy on their own while they are relaxing. Come visit Wolmyeongdong and experience relaxing on this comfortable and big rock for yourself!